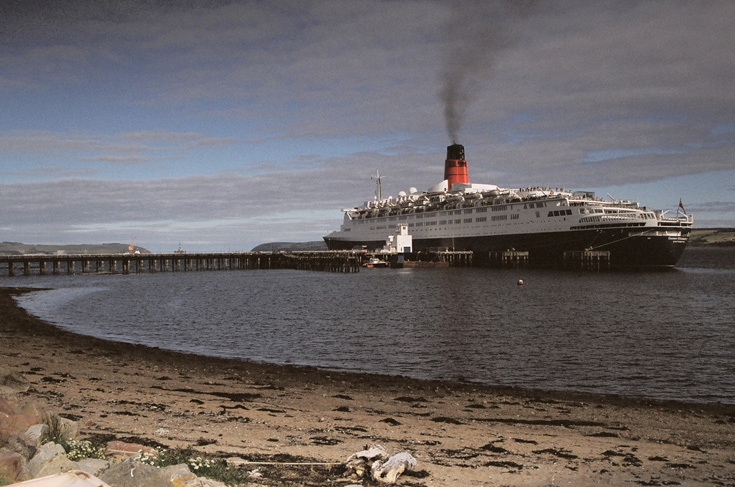 I'm sure you'll remember the QE2 Cruise Liner visiting Invergordon in August 2005. My Mother Jane (Macdonald) Shivas and I were visiting relatives in Invergordon while we were on a holiday in Scotland. While we were there the QE2 Cruise Liner was docked at the Admiralty Pier, however was shortly departing. You don't realise how small the Harbour Master's and Paddy's offices are until you see the QE2 alongside. Hi Eddie, looks like she could use a tune-up doesnt it ? Hi Harry. Normally this would have incurred the wrath of the local port authorities, but maybe a queen gets a bit of leeway.